← One or two Hairy Mitreworts (Mitrasacme pilosa)? 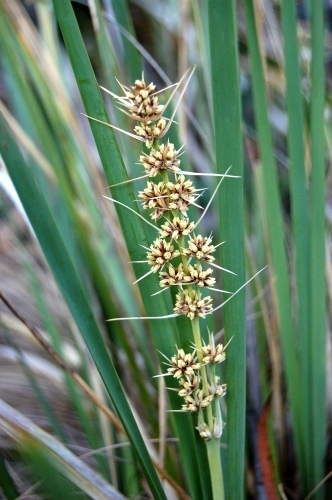 There must be hardly a single Tasmanian who has never seen the Sagg (Lomandra longifolia), one of the most widespread and common of plants in Tasmania. It is also widely cultivated as a native horticultural plant. Despite being a very common element in the Australian flora, the Sagg and it’s relatives have a rather complex family history. 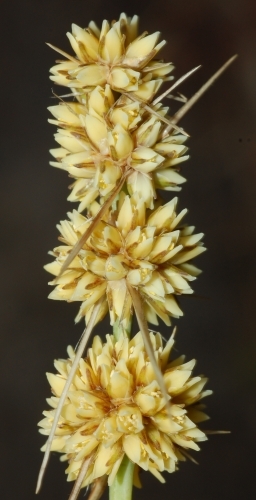 While the Sagg resembles a sedge or a grass, it is nowhere related to these two plant groups. Some people refer to Sagg and it’s relatives as a mat-rushes, but these again are nowhere related to the real rushes (Juncus spp.). Plant taxonomists have placed Lomandra variously into the Grasstree family (Xanthorrhoeaceae) and even into a family of it’s own, Lomandraceae. Surprisingly, the Angiosperm Phylogeny Group suggests that the Sagg is a member of the Laxmanniaceae, the same family to which Chocolate lillies or Vanilla lilies (Arthropodium spp.) and fringelilies (Thysanotus spp.) belong. Despite grasses and grass-like plants being very difficult for the budding naturalist to identify, the Sagg is extrmely easy to pick out. In a non-flowering state, they can be easily picked out by their forked leaf tips. When in flower, the heads of cream flowered blossoms subtended by bract-like spines cannot be mistaken for anything else. The white inner leaf bases of the plants are apparently edible and according to Tim, tastes like fresh green peas. I wanted to try for myself and so harvested a few stems. Proper care should be taken when harvesting Sagg stems. I ran my fingers gingerly all the way down to the base of the plant and felt around till I could get a good secure grip before pulling the plant out of the ground. This I did because the leaves, like many sedge leaves, have edges which are more than capable of giving one a serious laceration. The leaves were apparently used by aboringes as material for basket making of which I have written of in a previous post. 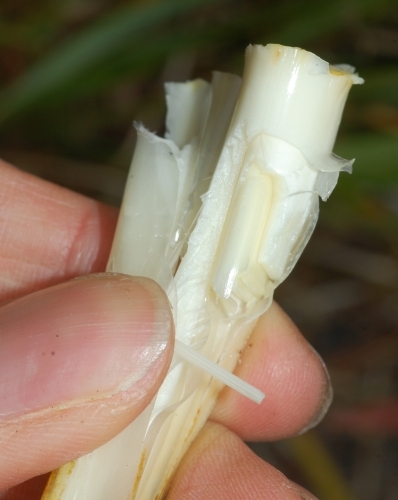 The base of the stem is whitish and cylindrical and is fine to just chew on. One could also remove the leaf bases around the stem base and get to the pith, which has somewhat the texture of a bamboo shoots. I agree with Tim though that the Sagg makes a refreshing snack. I also tried out the flowers but they were rather tasteless. Perhaps evening was not a good time to eat the flowers. In any case, if the flowers are to be eaten, do be careful of the ‘spines’ on the inflorescence. Not nice perforating one’s tongue or lips. Nevertheless, bush rambling will never be the same again now that I have been initiated into the Sagg snack. This entry was posted in Bush Tucker, Key Characters. Bookmark the permalink.